Luigi Embergher, February 4, 1856 - May 12, 1943. Born in Arpino (Italy) a town near Rome, Antonio Luigi Embergher grew up in a family of wood craftsmen. Luigi Embergher first worked as a craftsman making fine wooden tools and machinery needed in the Arpino wool industry. Mainly due to the economical crisis this industry nearly vanished in the last 30 years of the 19th century and like many others the Emberghers were forced to change their profession. In 1870 they founded a musical string instrument factory named: 'Fabbrica Strumenti Musicale a Corda'. It is assumed that in the 10 years that followed Luigi Embergher learned the musical instrument makers craft as a luthier apprentice in Arpino and later in Rome. Although not completely certain it is most likely that Luigi Embergher became acquainted with two important Roman luthiers named Giovanni De Santis and Giovanni Battista Maldura. These two luthiers were among the first to developed the modern Roman mandolin to such high standards as we know it today. It seems clear that the improvements seen in their mandolin models such as the radius fingerboard and V-shaped neck and the manner in which they are constructed were of great influence to Embergher. Around 1880 Luigi Embergher took over the family workshop and it is from then that making plucked and plectrum played instruments became the main occupation of the Embergher atelier. The instruments were first sold in Arpino and only later, around 1889 in a shop located at the 'Via dei Greci No. 21' in the center of Rome called �Casa Embergher�. From then the shop would change several times before it finally settled in the �Via Belsiana N. 7'. Here it was, although with some periods of closure, open from 1915 to 1960. In 1897 Luigi Embergher was rewarded a golden medal for his contribution to improve the mandolin at an Industrial Exhibition for new inventions in Vienna. A distinction that marked the beginning of Embergher�s highly successful carrier and the first of many awards Embergher was honored with for the excellent sound qualities and the high standard of craftsmanship of his instruments. In 1913 Embergher was knighted as �Cavaliere della Corona d'Italia� (Knight of the Order of the Italian Crown). Towards the 1920s Luigi Embergher had created eight different mandolin types/models, including 2 bottom line types for beginners and students, 4 middle class models for orchestra players, 3 high grade models for soloists and 2 luxury mandolin models. All instruments in their own merit being much appreciated by teachers, orchestra players and concert mandolinists in Italy as well as abroad. Beside these mandolins and their related family members Embergher also developed special mandolin kinds in commission. Each mandolin type/model was made with the utmost care and best materials available ensuring the ideal sound and playability of all mandolins manufactured in the Embergher atelier. The main difference between the instruments only laying in the wood and (fret) metal choice, the number of ribs of the bowl, the decoration materials on the mandolin and the internal difference seen in the placement of the tone bars in the higher grade models. During the late twenties Embergher faced great difficulties because his business was hit hard by the political regime. A situation that led to a halt on the export of his instruments and following on that, to only a few workers in the atelier. Around 1930 Benedetto Macioce, one of Emberghers foreman, carried on the production of instruments at the atelier in Arpino. In 1935 Embergher decided to close the shop, while a limited production of instruments continued to be made in the atelier. In February 1938 Embergher, then 82 years old, decided to officially appoint Domenico Cerrone (1891- 1954) as his successor. Antonio Luigi Embergher died in Rome on the 12th of May in 1943. Domenico Cerrone, who had established himself as an independent luthier in Arpino around 1930, was one of the finest luthiers trained by Luigi Embergher. He continued the Embergher business leading it from 1938 till his death in 1954 after which he was succeeded by his son Giannino Cerrone (1924 - 1993). Giannino together with Loreto Ronaldi (b.1935) and his nephew Pascuale Pecoraro (1907 �1987), who had also been taught by Luigi Embergher, kept the business going maintaining the high standard of the instruments until 1960. In that year the decision was taken to close the atelier in Arpino and the shop in Rome for good. From then on up to the late 80s Pascuale Pecoraro continued under his own name to work for himself making instruments of the mandolin family in the Roman style. And although he altered the famous �Embergher� design of several mandolin models slightly and used different inlay patterns to decorate them, a mandolin of his hand is still regarded as an �Embergher� mandolin. 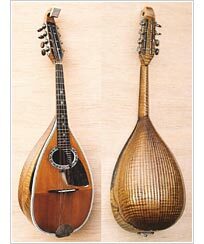 The success of the �Embergher� instruments of the mandolin family and in particular that of the No 5-bis Embergher Concert mandolin model (photo above), is found in their excellent sound quality and playability and in the fact that they were made in the best tradition of Roman mandolin making.